As many of you know, this has been a tough year for the legislature. But this wasn’t the first time in my twelve years that we had a difficult session and I was proud of the way both parties came together in the end to make the necessary choices for moving the state forward. Continuing to operate the state under the governor’s executive order would have been devastating for Connecticut. To break the impasse, every legislator, including myself, had to compromise on what the ideal budget would have been. But throughout this process my priorities never changed: Protecting the vital needs of our most vulnerable and ensuring the students of Meriden and Berlin received adequate funding and opportunities. I will speak more about the budget and what it means for our district later in this newsletter. As the House chair of the Human Services Committee, I made it my priority to improve the support services available for the people of Connecticut and protect everyone’s well-being. It is a privilege to be a voice for people who need the services. Despite the budget constraints, we have made progress in autism advocacy and safe haven laws. Working with the deaf and hard of hearing community has also been a privilege as we debated issues affecting them. One of my favorite things this year was continuing to host Autism Awareness Day. 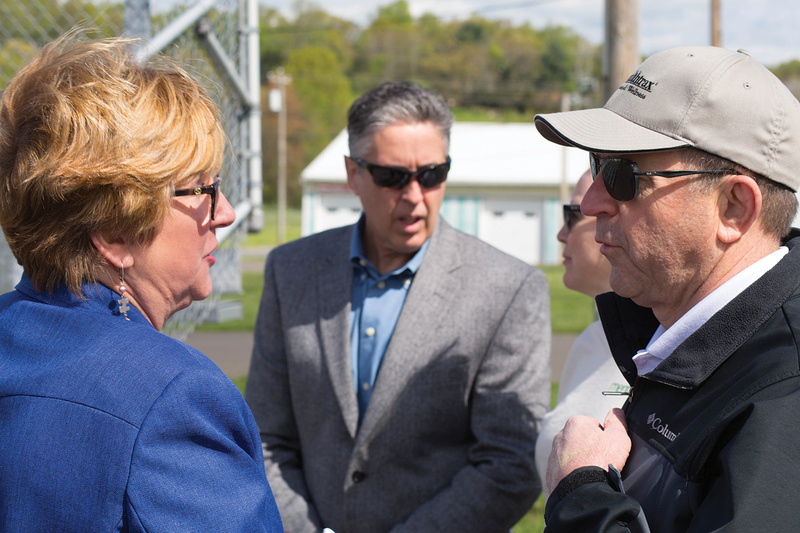 I was also honored to participate in a water safety awareness discussion with my colleagues on both sides of the aisle, and with friends from the Meriden YMCA. Throughout my tenure, I have had the same goal: To keep Connecticut a place where you’d want to live and raise your family, as I have done with mine. I want Connecticut to be a place where young residents can work and call home. A place where everyone feels welcome. As always, if you would like to reach out to me, I am available both by email phone and on social media. My door is always open. Meriden has had a great year. 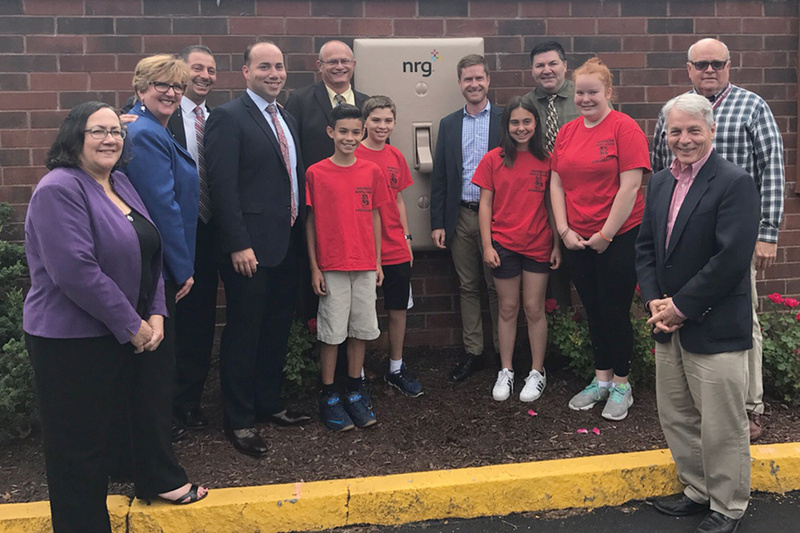 At the middle schools, students learned about the benefits of clean energy thanks to a public-private partnership with NRG which installed solar panels at both schools at no cost. Platt High School completed its remodel on time and under budget and at the Downtown Meriden Rising event, I was presented with the transit oriented development (TOD) plans for downtown. The city’s TOD program seeks to transform the half-mile to include new residential and commercial development, public spaces, and improved access to public transportation. Several of these projects are completed or underway, including residential units, commercial space, a 14 acre town green, as well as a few demolition projects. Representative Abercrombie at the Berlin Mental Health Fair. This spring, I was invited by a young constituent to speak at the Berlin Mental Health Fair. In 2017, Connecticut was ranked first in mental health and came in the top five for access to care. This session, and throughout my time in office, I have worked to ensure that those who need care have access to it. This session the legislature passed PA 17-61, which seeks to minimize the waiting lists for residential homes for those with intellectual disabilities, and PA 17-5, which protects the youth of Connecticut from conversion therapy practices. Representative Abercrombie with the Meriden Middle School Solar Project. 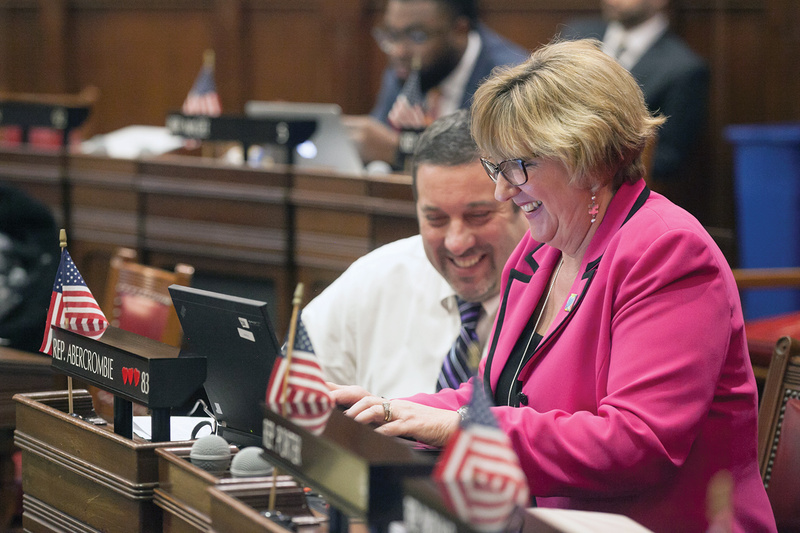 After several months of negotiations, the state budget was favorably voted out of the House and Senate and signed by the governor in late October. In this budget, we protected state aid for education. Meriden will be receiving $60,258,395 and Berlin will be receiving $5,904,926. In addition, we restored the vast majority of cuts in non-education municipal aid that the governor proposed, helping to keep local services and hold the line on property taxes. We preserved the $200 property tax credit for seniors and residents with dependents, and the property tax exemption available to honorably discharged veterans. Social Security and pensions are exempt from state income starting in 2019. We maintained a portion of the earned income tax credit available to working families, although the amount has been reduced. We agreed to a number of structural changes that will help put our state on a better track including: a strengthened spending cap, a bonding cap, and required votes on state employee union contracts. We were also able to negotiate the increase in teacher pension funds contributions down from the original 2% increase to 1% while avoiding the governor’s plan to shift pension funding to cities and towns. Every line item in this budget was a compromise and ultimately, supporting it was in the best interests of the towns and people I represent. With next session only a few months away, we have agreed to keep working through the issues and continue fighting for the people of Connecticut. As chair of the Human Services Committee, I am dedicated to serving all communities. This session, I championed PA 17-30, which reconstituted an advisory board for the deaf and hard of hearing community that will advocate, strengthen, and advise the General Assembly regarding state policies that affect them. This legislation was signed by the governor in June and I look forward to its implementation. Public Act 17-18 strengthens Safe Haven protections for infants in the program, and those that care for them. Connecticut’s Safe Haven law allows an infant to be left at a hospital emergency room within 30 days of birth so that parents who find themselves in desperate situations have a safe place to leave that infant without fear of arrest. Since it began in CT in 2000, 27 infants have been placed through the Safe Haven Program. Representative Abercrombie working on Human Services legislation with Representative Case. After several years of work, I was proud this year to pass legislation to create a new license for behavioral analysts. These professionals are particularly helpful in working with those who have autism. By establishing this license, and better regulating the profession, we can make sure that those who need services get high quality care. To obtain a license, applicants must be certified by the Behavioral Analysts Certification Board or eligible for licensure by endorsement. Those individuals providing behavioral analysis while acting within the scope of their profession may continue to do so.